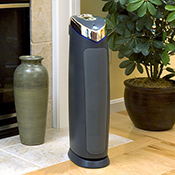 Germ Guardian AC5000 UVC HEPA Air Purifier is a simple and affordable tower air purifier with 5-levels or air cleaning: pre-filter, Hepa, charcoal, photocatalyst, and UVC light. It is quiet and has 3 speeds, manual controls and during our tests, it very efficiently removed airborne particles, odors and kills and prevents the growth of germs, viruses, bacteria and mold spores. Weights 10.5 lbs and has a carry handle. Need more details? See ratings, a complete review and current prices for the Germ Guardian AC5000 UVC HEPA Air Purifier at AllergyBuyersClub. Also see the complete selection of other air purifiers.